Actinic Keratoses (also known as, solar keratoses) are considered precancerous skin lesions. They are rough, scaling spots that develops from years of sun exposure. Some actinic keratoses can eventually turn into a type of skin cancer known as squamous cell carcinoma. See Squamous Cell Carcinomas for more info. Therefore, it is very important that a dermatologist perform routine skin exams to evaluate and treat these skin lesions early, before they become skin cancers. Actinic keratoses are most commonly found on sun-exposed areas, such as the face, scalp, lips, ears, neck, forearms, and backs of hands. They are rough or scaly to touch and may be associated with itching, burning, or even sensitivity. Actinic keratoses are caused by frequent exposure to UV rays from sunlight or tanning bed use. Prevention is key! 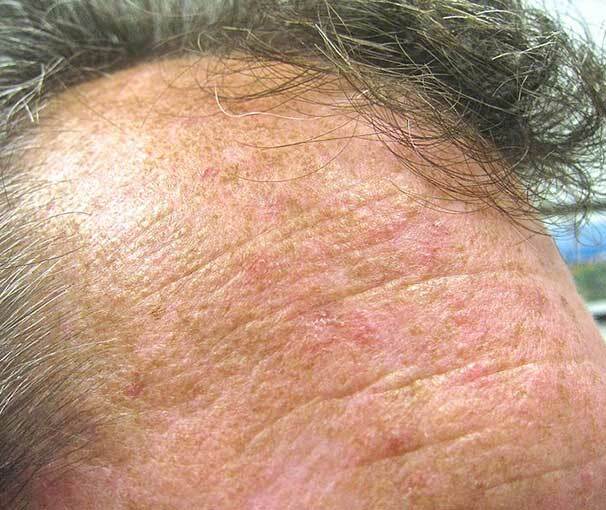 Sun protection can reduce the number of new lesions. Use sunscreen on all exposed skin before going outdoors. Be sure the sunscreen has broad spectrum coverage which blocks both UVA and UVB light, with an SPF of at least 30 or more. Remember to reapply every 2 hours and immediately after swimming or sweating. Avoid sun exposure during peak hours (from 10 am to 3 pm). Cover up. Wear a broad-brimmed hat and tightly-woven clothing that protects your arms and legs. Perform self-skin exams monthly. Monitor your skin lesions for any changes in size, shape, color, and/or skin symptoms (such as, itching, bleeding, or pain). Other possible treatment options include chemical peels, photodynamic therapy, and/or lasers. Sometimes, a skin biopsy will be performed to evaluate for possible skin cancer. If you are interested in learning more about treatment options for your actinic keratoses, please call Heller Dermatology & Aesthetic Surgery to schedule your appointment!